Chacras de Coria. Mendoza, Argentina. 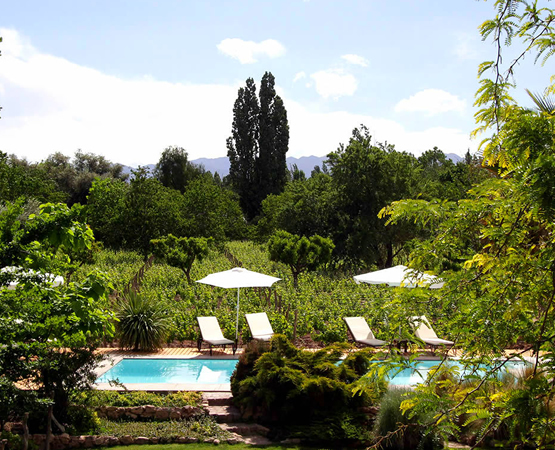 In the small town of Chacras de Coria we find Finca Adalgisa, the first rural hotel with wine cellar of Mendoza, surrounded by two hectares of malbec grape vineyards. 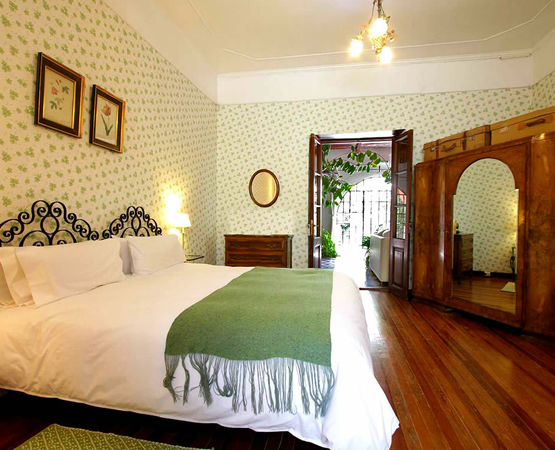 It Is a discreet and very private hotel, only 20 minutes of the city of Mendoza and just few blocks from the main square of the town of Chacras Coria. Its rustic and comfortable eleven rooms are distributed among the old house and the stone house. The guests are welcome besides to visit the wine cellar, to be familiarized with the process of fermentation and to taste their limited and exclusive production of wine Malbec. Finca Adalgisa has all the necessary installations to do of your staying an extraordinary experience. The old library of the family is found at the disposal of all the guests, jointly with a computer connected to Internet 24 hours, besides there is internet wi-fi in all the hotel. The Farm has a small wine cellar, where besides being able to do a tasting of its wines Malbec will also be able to enjoy the boards with a great goat cheeses variety and cow as thus also of different cold cuts and some vegetables. grilladas. It has a conference room for events and rounds of business equipped also with internet wireless. * Bicycles, (you can have the bicycles freely and without any cost, to travel through the streets of the town, to visit wine cellars or to go to the mountains). * Internet, the guests will be able to use our computer always connected to Internet, as also to enjoy the areas with wireless. * Basket of picnic, we offer you ours picnics basket for enoying a free day on the country. * Sports, our team of receptionists will help you to organize your preffered sport. We offer you also a personal trainer service. * Games, we have an extensive variety of games and cards. * Transfer In/Out from the airport. * Fiesta Nacional de la Vendimia. Finca Adalgisa has two different wings with rooms for guests. They are designed for comfort and relax, with excellent decorative and architectural details that are in accordance with the rustic and rural style of the Farm. Old House: The Old House has the typical copper color of the buildings of long ago. This section has 3 rooms. The old furniture of the family makes this place charming and cozy. Here the guests are able to enjoy the authentic history of Mendoza. All the rooms are equipped with air conditioning, heating, telephone, private bathroom and safe deposit box. Stone House: In a different section of the Old House, there are 8 rooms built in stone with a view to the vineyards. These rooms are also high quality and comfortable, and are equipped with air conditioning, heating, telephone, private bathroom and safe deposit box. 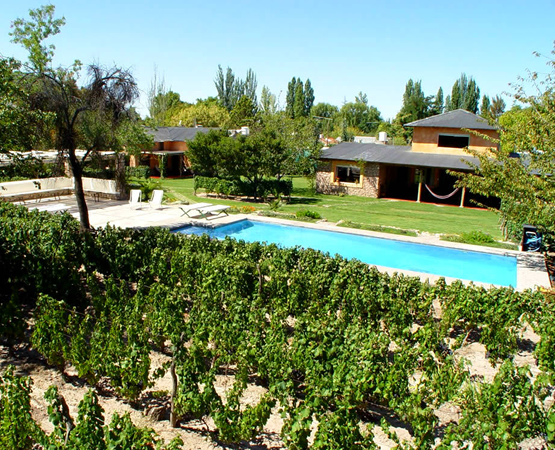 This splendid farm has 2 hectares of Malbec vineyards, which were planted in 1916. There is a small wine cellar that allows the tourists to follow the whole wine process from harvesting to its final stage of elaboration. Vineyard: Malbec vineyard planted in 1916. Harvested: manually, at the beginning of April. Vineyard average production: 6,000 kilograms per hectare. Wine Cellar average production: 8,000 bottles. Breeding: 30% in casks of French oak tree during 12 months. Minimum storage time: 6 months. 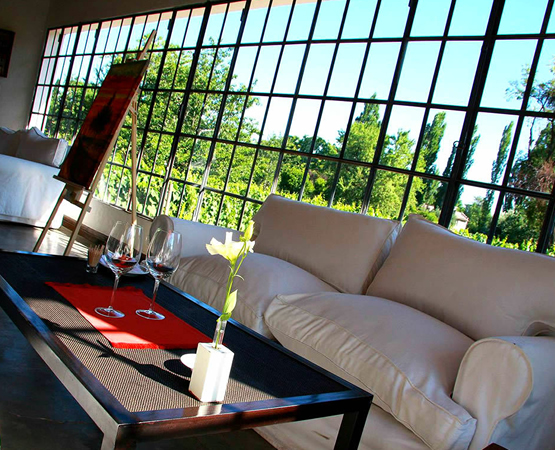 Other Activities: Wine Tours to local wineries and vineyards in Mendoza. 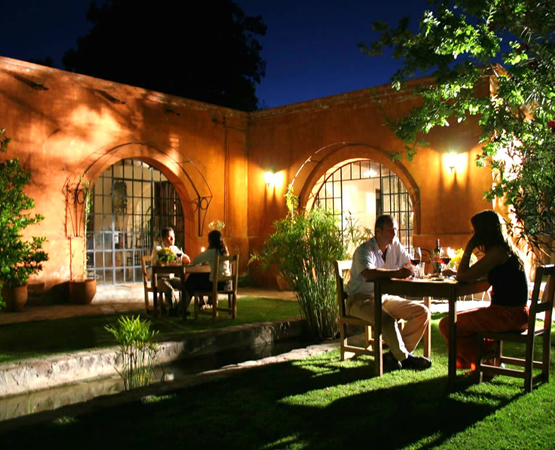 In the small town of Chacras de Coria we find Finca Adalgisa, the first rural hotel with wine cellar of Mendoza. Chacras de Coria is located 15 Km. to the southwest of Mendoza city. A town that gathers all the qualities to live or simply to spend a few days. It nailed in the heart of winegrowing areas. Around a typical square, with a parish of neocolonial architecture and small stores, tour the everyday life of the locals. Mondays to Fridays from 10 to 18 hs. Copyright © 2019 argentinawinehotels.com. All rights reserved. Argentina Wine Hotels and Logo are registered trademarks.